As a teenager, I thought drinking bubble tea would be a fad. Just like Orbitz, a juice with small spheres of fruit floating throughout, its popularity would wane once consumers got over the novelty of having food in their drinks. Yet, my psychic abilities are non-existent, thankfully, and consumption is still going strong. Although the drink didn’t arrive in Toronto until the mid-1990’s, it was developed in 1988 when a product development manager at Chun Shui Tang (a Taiwanese teahouse) added sweetened tapioca pudding to their tea and the company loved it so much they started selling it! For those not in the know, at its simplest, bubble tea is the combination of sweetened tea with a food additive, which isn’t necessarily tapioca (although it’s the most popular choice). In fact, the “bubble” in the name has nothing to do with these pearls, but rather the foamy bubbles floating on top that’s developed through the shaking process. Nowadays the drink and topping options seem endless. 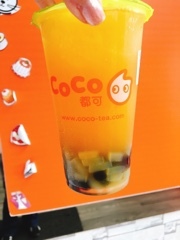 At CoCo Fresh Tea and Juice, refreshing juices are added in the base and even chopped fresh fruit on top. Nevertheless, there’s something about the tried and true ingredients that still draw people in. Over March, as fans were voting for their favourite drinks, with the exception of passion fruit juice, the winners had scarcely a fruit in sight. 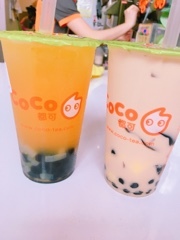 Although a little sweet at first, despite getting the drink at 50% sugariness, the Bubble GaGa ($4.20 for regular or $4.70 for large) is rather refreshing with its passion fruit and green tea base. It’d be great for the warmer months as one begins to crave something tropical since it also incorporates coconut jelly with the tapioca. But my favourite has to be the 3 Guys ($5 for regular or $5.50 for large), a simple milk tea with three toppings: tapioca, pudding and grass jelly! The tapioca provides that requisite chewiness and the grass jelly an interesting herbal property to the tea. Yet, it’s the pudding, an ingredient I’ve never tried, that’s most surprising adding a silky creaminess when you get a bite with the drink. The two top drinks noted above are on sale for April where you can get the large for just $3.80. 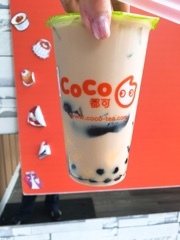 During April share a photo of CoCo’s tea using hashtag #CoCo20th on any social media platform and that’s your entry towards their contest for winning one month of free CoCo products (that’s one a day)! There will be five winners and to help you along the way, CoCo has photo booths set up in Ontario locations. Happy birthday CoCo Fresh Tea and good luck to all. May the bubbles be with you. Disclaimer: The above drinks were complimentary. Rest assured, as noted in my mission statement, I will always provide an honest opinion.